Originally posted: September 16, 2017 . Last modified: April 8, 2019 . 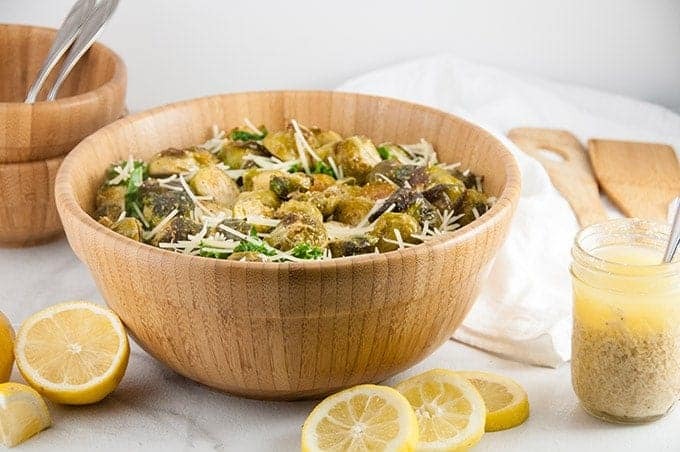 A Roasted Brussel Sprouts Caesar Salad is the perfect balance of hearty, roasted Brussel sprouts and light, Caesar salad. It’s exactly what you need when you want a little something more than the traditional Caesar salad. Hi everyone! I’m Jenna from over at Seasoned Sprinkles, and I’m a bloggy friend of Kim’s. I saw that Kim was affected by Hurricane Irma so I offered to help out and write a post while Kim and John get back to normal after the storm. I thought I’d share one of my favorite fall salads with you all: this roasted Brussel sprouts caesar salad. This time of year, I’m in a weird transition. I live in the northeast so September can be funky. Sometimes it is prematurely cool here the way it was through the end of August and Labor Day weekend. As soon as the first hint of chill comes into the air, I’m like give me all the comfort food. And I do mean all of it and of course, I want pumpkin everything like Grandma’s Pumpkin Roll that Kim posted a few weeks ago or my Pumpkin Parmesan Pizza with Brown Butter Onions and Kale. But then summer comes back. That’s where it’s at today here. As I write this, a warm, muggy breeze blows through my window. My confused legs are wearing shorts. My pumpkin coffee creamer feels oddly out of place. So I start to want salads and lighter feeling fare again, but I still want them to feel a little heartier than summer salads. Make sense? Ok good. 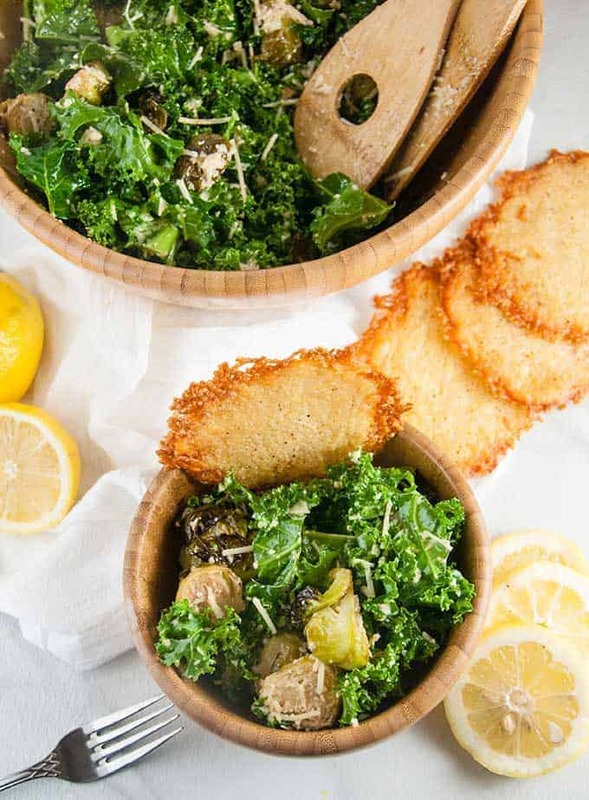 Well, this roasted brussel sprout caesar salad is the perfect mix of hearty and lighter. It’ll be on our dinner menu for sure a few during this warm snap we are having. I might mix in a buffalo chicken Caesar salad or shaved brussel sprout salad too, you know for variety. The roasted Brussel sprouts give it a nice earthy feel. They are full of flavor from roasting them with garlic, Parmesan cheese, and full-bodied olive oil so there’s an extra layer of interest to this salad. 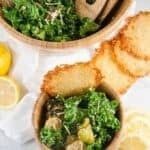 For the greens, you can use any greens you like, however, I prefer a really crunchy green that holds its texture well so I use kale as a base. Just remove the thick stalks and quick chop it. You could also use romaine hearts or even collard greens, any sturdy green your little heart desires. Then I drizzle it with my homemade, egg-free Caesar salad dressing and top it with lots of extra Parmesan cheese. And for extra crunch, I finish it all of with my baked Parmesan crisps. OMG. The best. I could snack on those alllll day. If you’re looking for something to pair with this salad, try our fried cabbage. 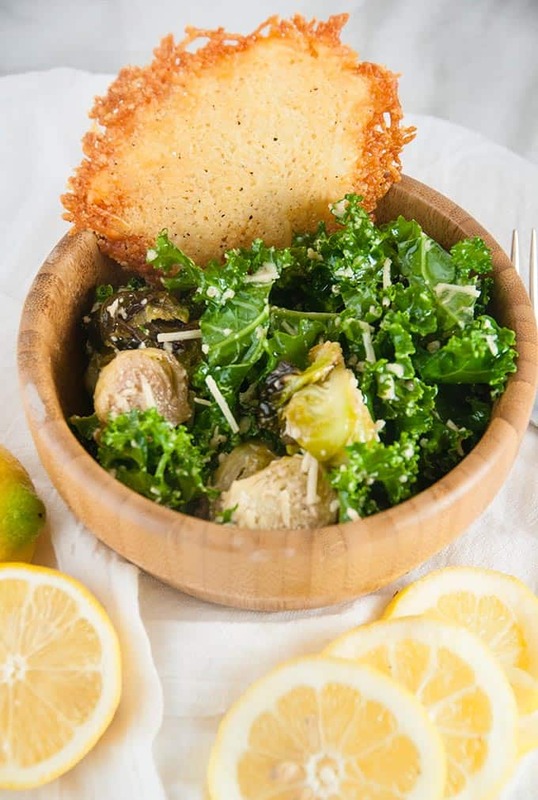 If you like this Roasted Caesar Brussel Sprout Salad recipe, please leave us a comment and rate the recipe card. You can also find us on Facebook, Pinterest, Twitter and Instagram searching for Berly’s Kitchen! Garlic Parmesan Roasted Brussel Sprouts make this Roasted Brussel Sprout Caesar Salad something special. Preheat the oven to 400. Cut the flat bottom end off of the brussel sprouts and then cut them in half. Toss with olive oil, Parmesan, crushed garlic, salt, pepper, and Balsamic until they are evenly covered. Spread the dressed brussel sprouts over a cookie tray with aluminum foil and sprayed with nonstick spray. Roast in a 400 degree oven for 30-35 minutes or until edges of the sprouts begin to brown, turning halfway through. Remove from oven and let cool. Toss the grated and shredded Parmesan cheese together with salt, pepper and garlic powder. Press the mixture into flat circles and lay the circles on a cookie sheet sprayed with nonstick spray. Bake at 400 until the cheese is golden and crisp, between 3 and 5 minutes. Remove from oven. Add all of the ingredients for the dressing together and whisk until combined. Whisk again prior to serving. 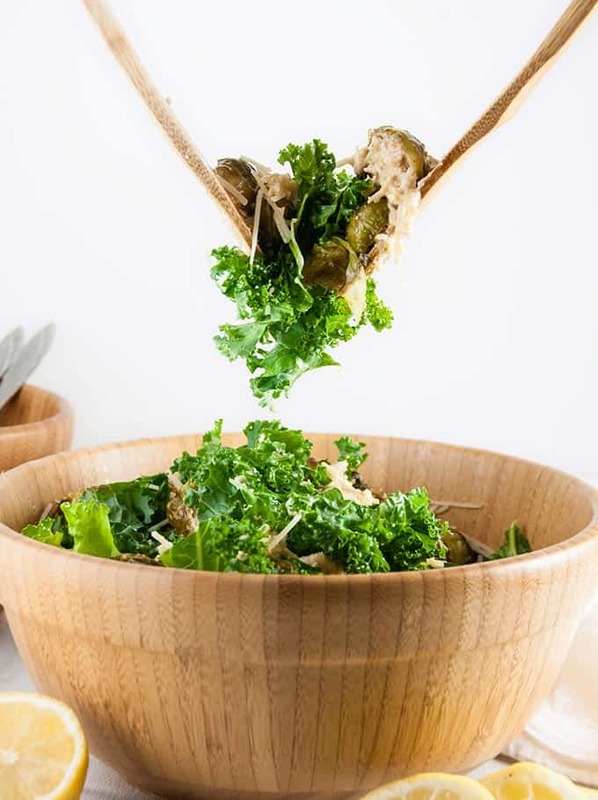 Remove the stalks from the kale and chop. Place in a large salad bowl. Add Parmesan cheese and brussel sprouts. Toss together and drizzle with salad dressing. Toss again. Serve and garnish with Parmesan cheese crisps. This sounds really good! I’m always looking for new salad recipes, so I’ll have to try this out. This looks great! Those parmesan crisps are getting made for sure asap! Yum yum. Awesome you are helping Kim out btw! This looks and sounds so good. I love Brussel Sprouts! 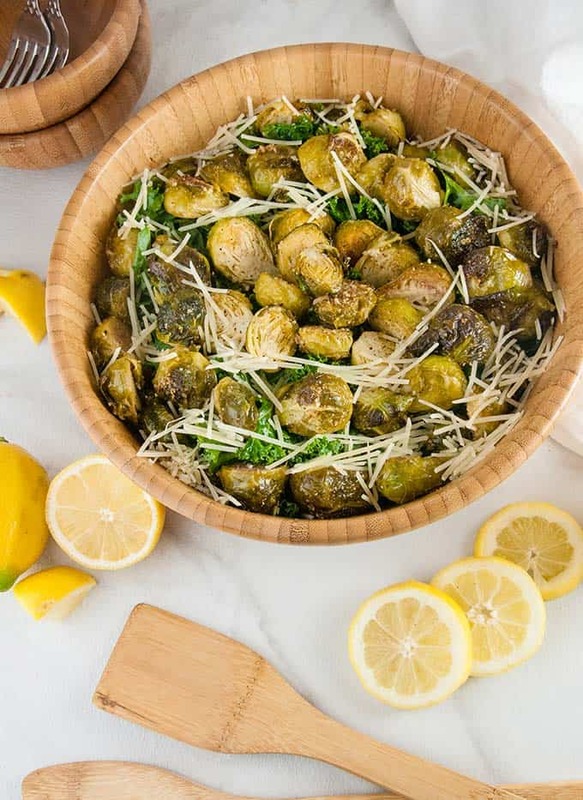 This looks very tasty, I love eating brussel sprouts. I am trying your recipe, I always bake mine and sometimes I sauteed them as well. Great photos by the way.